July 31, 2015 – Raytheon has made a four-year commitment to Colorado Springs and the Space Foundation to provide educational opportunities to inspire the next generation of innovators through science, technology, engineering, and math (STEM) education. Raytheon will be sponsoring STEM related educational activities at the Space Foundation’s Discovery Center through 2018 and will be the premier sponsor for the museum’s Summer of Discovery 10-week educational series. 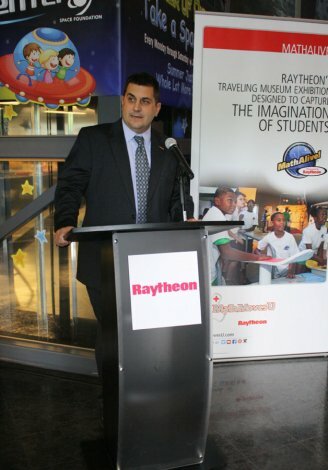 In addition to funding the popular summer programs, this new partnership will also support local school districts’ visits to the museum through the Raytheon ScholarTrips Program which provides transportation and admissions costs for school districts interested in bringing STEM education to their students. Raytheon is also planning to bring its highly interactive traveling MathAlive!® exhibit to the Space Foundation’s Discovery Center during the first half of 2016. MathAlive! has drawn record-breaking attendance at museums across the United States by inviting visitors to experience math in action. Primarily designed for kids in grades 3-8, the exhibition brings to life the real math behind what kids love most — video games, sports, fashion, music, robotics and more. MathAlive! creates interactive and immersive experiences for students that demonstrate the relevance of STEM in their everyday lives, and is part of Raytheon’s MathMovesU® national program to inspire students to embrace mathematics as a key to their future.